La vie est belle! 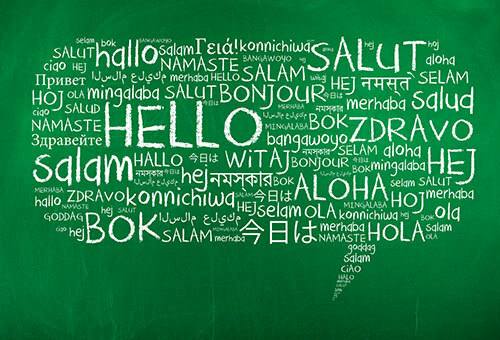 Learn another language with many online and classroom options. Introduce high-level grammar concepts for the high level ELL students. Students will learn a sophisticated analysis of the grammatical structures of English. New students, prior to registration contact 920-735-2443 for an assessment to determine your proficiency in English. Provides comprehensive language training to English language learners while the course instruction focuses on advanced-level listening and speaking skills. Learners will improve their fluency through discussions and debates on a wide variety of topics. This class also trains learners to deepen their critical thinking skills and speaking skills that are essential to success in college-level technical programs. New students, prior to registration contact 920-735-2443 for an assessment to determine your proficiency in English. Provides students comprehensive language training focusing on advanced-level listening and speaking skills. Learners will improve and master fluency through online discussions, debates, and presentations on a wide variety of topics. Students will also develop their critical and creative thinking skills. The class prepares students for advanced communication courses online or in American colleges and universities. New students, prior to registration contact 920-735-2443 for an assessment to determine your proficiency in English. Provides comprehensive language training in advanced academic reading for English language learners to prepare for college-level technical programs focusing on variety of reading comprehension skills, critical thinking, and vocabulary development. New students, prior to registration contact 920-735-2443 for an assessment to determine your proficiency in English. Provides students comprehensive language training in advanced academic reading and vocabulary in order to prepare for college-level coursework. The Academic Word List is expanded, and critical thinking skills are developed. The class prepares students for program courses online or in American colleges and universities. New students, prior to registration contact 920-735-2443 for an assessment to determine your proficiency in English. For those who want to learn English as a foreign language students will develop the tools needed to write academic essays in many rhetorical styles such as comparing, contrasting, describing causes and effects, and analyzing and supporting arguments. Students will also develop and apply strategies for taking an essay exam. In addition, the course introduces how to incorporate paraphrases and quotations from other writers. Finally, students will complete a library research paper. New students, prior to registration contact 920-735-2443 for an assessment to determine your proficiency in English. Provides students comprehensive language training focusing on mastering the skills needed to write academic essays, exams, and reports in many rhetorical styles. The course offers a sophisticated analysis of the grammatical structures of English. The class prepares students for writing across the academic curriculum online or in American colleges and universities. New students, prior to registration contact 920-735-2443 for an assessment to determine your proficiency in English. Develop English pronunciation to make communication more comprehensible. Focus on vowel clarification, consonant reproduction, intonation, stress, blends, and reductions. In addition, students have the opportunity to acquire new vocabulary, practice presentation skills, and present monologues and dialogue. New students, prior to registration contact 920-735-2443 for an assessment to determine your proficiency in English. Establishes a foundation in the Mandarin Chinese language presenting everyday situations. It focuses on vocabulary building, basic grammar, word recognition and usage, conversation, and understanding of culture and tradition. Builds on a foundation in the Chinese Mandarin 1, presenting the language of everyday situations and focuses on vocabulary expansion, basic grammar, word recognition and usage, conversation, and understanding of culture and tradition.